The mug with the mobility and mission to change six million lives is here, and the product line is getting geeked out with new upgrades. Meet the Fleximug. A new generation of entrepreneurs and healthcare startups have been empowering the disability community to not only get better access to information and treatment, but to command their worlds, and look good doing it. Sometimes we can do more to gain physical control over our lives than we think, and often it’s the little things that make the biggest difference. Fleximug was built with this idea in mind. If you have limited arm movement or know someone with paralysis or quadriplegia, you’re familiar with the pain and aggravation that can come from the need to depend on others for daily living. 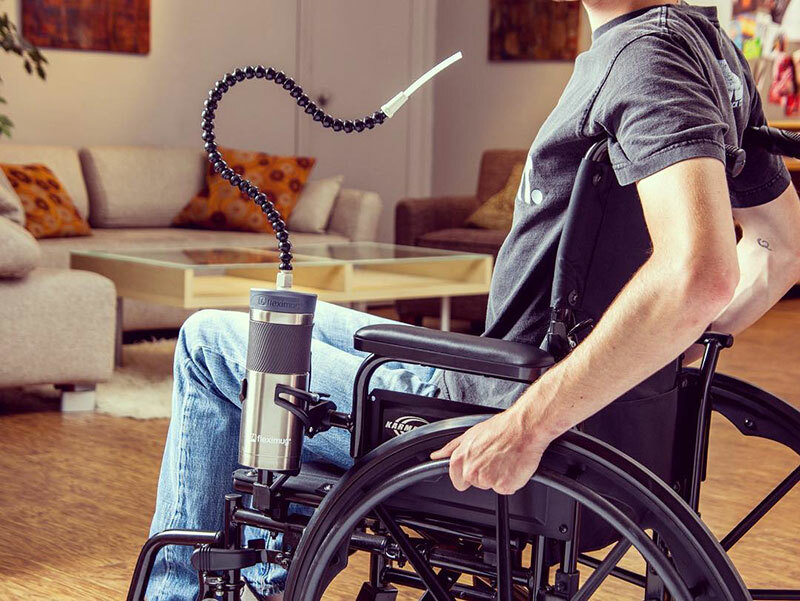 Fleximug has produced a patented hands-free drinking system designed to make the world bend to six million Americans living with paralysis. The mug itself is a high quality stainless steel thermal container, like any you would find at REI or Starbucks, designed to stay hot or cold for many hours. Fleximug has made a custom injection molded lid with a one-way valve, and a great stiff and poseable long reach straw. The straws are easy to detach, and they’re replaceable, available in 24”, 28”, 32” and 36” sizes. Everything is high-grade stainless steel or plastics that rinse and wash easily. An included 18” tube brush comes in handy for cleaning the straw. The Fleximug team has recently taken the power of Fleximug and its unique technology even further by manufacturing Flexistand, a bedside/overbed table with a built-in cup holder, made from high-grade aluminum. Fleximug fits inside the cup holder in Flexistand, allowing users to drink hands-free in bed. Optional Tablet Supports attach to Flexistand to provide users with much-needed access to their entertainment and communication devices. 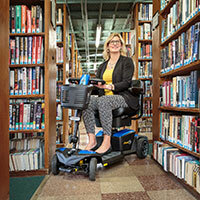 Find Fleximug or Flexistand online, on Amazon or at upcoming Abilities Expos. 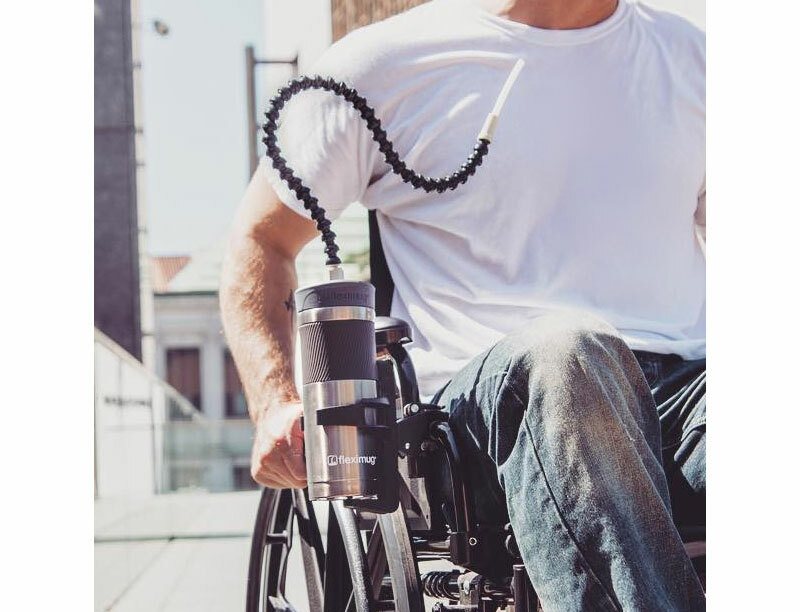 Fleximug isn’t just about a stylish mug, or even reducing health complications that result from dehydration—it’s about claiming and providing independence. The first sip from this gadget could be a first step toward greater personal empowerment. Get your Fleximug and Live Flexibly. For more information about Fleximug, visit www.fleximug.com.